Muay Thai is an intense, exciting and empowering ring sport. It’s also Thailand’s martial art, developed over 2,000 years ago for battlefield combat against foreign invaders. Now Thailand’s proud cultural heritage, Muay Thai lives on as the country’s national sport. The art has gained global recognition as one of the toughest and most effective combat arts in the world. Muay Thai is an intense, exciting and empowering ring sport. It’s also Thailand’s martial art, developed over a 2,000 years ago for battlefield combat against foreign invaders. In Thailand Muay Thai is a modern integration of traditional regional muays, be Muay Chaiya, Muay Korat, Muay Tarsao, Muay Jearng, which can be collectively called Muay Boran or “ancient boxing”. Krabi krabong nevertheless was an important influence on muay boran and so muay Thai can be seen in several kicks, holds and the movements in the wai khru which have their origins in armed combat. muay boran, and therefore muay Thai, was originally called toi muay or simply muay. Eventually, the previously bare-fisted fighters started wearing lengths of hemp rope around their hands and forearms. This type of match was called muay khat chueak. Muay gradually became a possible means of personal advancement as the nobility increasingly esteemed skillful practitioners of the art and invited selected fighters to come to live in the royal palace to teach muay to the staff of the royal household, soldiers, princes or the king’s personal guards.This “royal muay” was called muay luang. Some time during the Ayutthaya period, a platoon of royal guards was established, whose duty was to protect king and the country. They were known as Krom Nak Muay (“Muay Kick-Fighters’ Regiment”). The Burmese king, Lord Mangra, and his army ransacked Thailand’s magnificent temples and stole Thai treasures. Many of those who tried to defend the city were taken as slaves. Among them was Nai Khanom Tom a.k.a. the “Father of Muay Thai,”. The Burmese king ordered the Thai prisoners to go up against the best Burmese fighters in the courtyard. When it was Nai Khanom Tom’s turn, he asked for a moment to prepare. He then proceeded to make his way around the courtyard, dancing in a slow, ritualistic fashion. This led the Burmese fighters to believe that Nai Khanom Tom was cursing them with evil spirits before their match. When asked to explain, Nai Khanom Tom said that the ritual was his way of giving respect to his teacher, the art of fighting, and his country. It is widely believed that this legend explains the origins of Wai Kru, which is still performed by all Muay Thai fighters before a match today. Nai Khanom Tom easily knocked out the first fighter. The king then sent ten more warriors one after the other without breaks in between matches. Despite these odds, Nai Khanom Tom prevailed. Ascension of King Chulalongkorn (Rama V) to the throne in 1868 ushered in a golden age not only for muay but for the whole country of Thailand. Muay progressed greatly during the reign of Rama V as a direct result of the king’s personal interest in the art. The country was at peace and muay functioned as a means of physical exercise, self-defense, recreation, and personal advancement. Masters of the art began teaching muay in training camps where students were provided with food and shelter. Trainees would be treated as one family and it was customary for students to adopt the camp’s name as their own surname. Scouts would be sent by the royal family to organise matches between different camps. introduced and rounds were now timed by kick. Fighters at the Lumpinee Stadium began wearing modern gloves during training and in boxing matches against foreigners. Rope-binding was still used in fights between Thais but after the occurrence of a death in the ring, it was decided that fighters should wear gloves and cotton coverlets over the feet and ankles. It was also around this time that the term Muay Thai became commonly used while the older form of the style came to be known as Muay boran. With the success of muay Thai in the mixed martial arts, it has become the de facto style of choice for competitive stand up fighters. As a result, western practitioners have incorporated much more powerful hand striking techniques from boxing although some Thai purists accuse them of diluting the art. 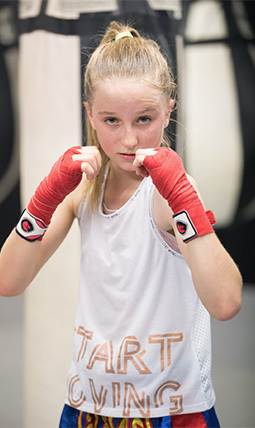 Matrix Gym offer a wide range of Muay Thai training programs to suit any skill level or age. Classes available for boys and girls from the ages 5 to 14 years old.